While one-year internships are common in the OPC and one-year vicariates are standard practice in the RCNZ, such arrangements are rare in the URCNA. But Covenant Reformed Church (URCNA) in Pella, IA, is planning a one-year internship with Pablo Landázuri. Pablo, who is from Quito, Ecuador, anticipates graduating from Mid-America Reformed Seminary on May 16 and longs to plant Reformed churches in his home country. Pending visa approval, he hopes to travel with his wife and three sons to visit relatives in Ecuador, returning to the US to work in Pella from June of 2013 until June of 2014. Covenant’s pastor, Rev. Doug Barnes, explains that the internship benefits the intern, the church Council, the congregation, and Christ’s church. It allows Mr. Landázuri to prepare for his candidacy exam in order to enter the mission field as a minister in the URC. At the same time, it will enable Covenant’s council to work closely with him in developing a joint venture committee to support and oversee his work. While Covenant’s leaders assist Pablo in preparing a solid plan prior to beginning his church planting effort, Covenant’s members will have time to forge strong bonds with the Landázuri family that will help sustain a long-term relationship. Since the official language in Ecuador is Spanish, it has been a natural fit for Pablo during his seminary years to work with Rev. Valentin Alpuche in his Chicago Heights ministry to Hispanics. But Pella is known more for its ethnic Dutch community. “Obviously, Pablo won’t be doing much Spanish exhorting in the Pella region,” admits Rev. Barnes, “so we will be encouraging the occasional pulpit supply in Chicago Heights. Pablo received a good education in Ecuador, although he now realizes the failures of his early education. During his years at a military academy, he became immersed in soccer and parties. He had the opportunity to attend the best university in the country, where he played on the soccer team. While in college, he married Verenisse and their son, Martin, was born. 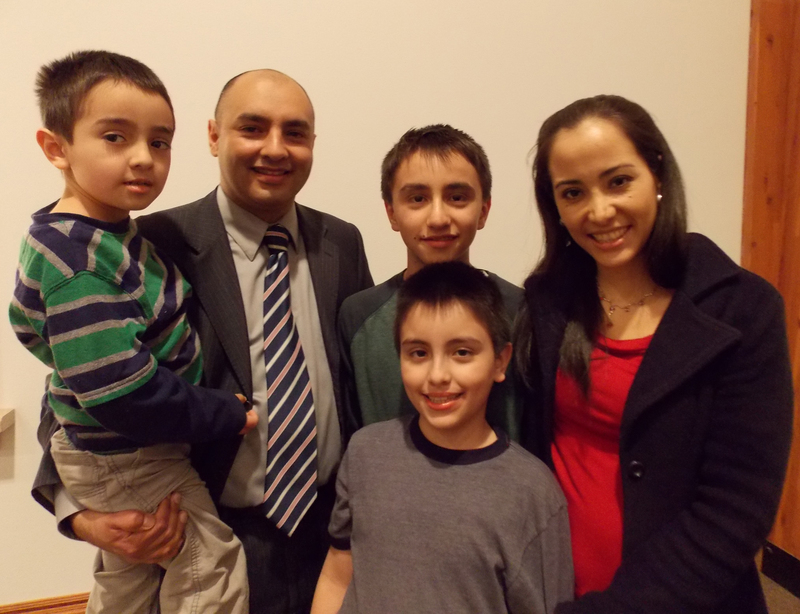 Pablo experienced great success as an industrial engineer, but he moved his family to Spain so he could further his career by obtaining his Master’s degree in Business Administration. That degree netted him a management position with Citibank in Quito, and a few years later he accepted an even better position. He focused on working hard and playing soccer. While he was enjoying success on both fronts, his personal life was a mess. “I became the best paid professional of my university class at the time,” he says. “yet my marriage was in very bad shape.” Marital problems led the couple to attend a Bible study at a Presbyterian church. But the family wasn’t willing to give up time together on Sunday in order to attend worship. And Pablo was still driven by his desire for success. He read a book by an atheist that equipped him to argue against Christianity, until one day a Christian co-worker challenged him to think about his eternal future. “I kept thinking about that conversation for days,” he says. Unable to sleep and suffering from anxiety, Pablo still could not get the conversation out of his head. One morning he came to an important conclusion. Pablo’s search for a Reformed Seminary led him to Mid-America, where he will soon complete his studies prior to beginning the internship at Covenant in Pella. The above article by Glenda Mathes appeared on pages 12-13 of the May 1, 2013, issue of Christian Renewal. The Landázuris have subsequently arrived in Pella where Pablo is serving his internship and preparing for his candidacy exam. The pulpit of El Pacto de Gracia in Chicago Heights awaits Pablo! And the congregation also longs to see the whole family again and rejoice with them! He preached in my church this past Sunday.